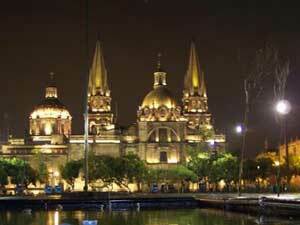 Guadalajara is the capital of the state of Jalisco and the second largest city of whole Mexico. The Guadalajara metropolitan area counts with about 5 Million inhabitants. The city can be described with 3 single words: Culture, Education and Business. Guadalajara is the cultural center of the western part of Mexico and features beside numerous museums and cultural fairs and events, some of the most famous Mexican artists. Besides its international book fair F.I.L. (Feria Internacional de Libros), the most important on the American continent, the UDG Universidad of Guadalajara is located in Guadalajara. The university is the second most important of Mexico and signs responsible for the foundation of numerous cultural and educational centers all over the state. Some of the most important products of Guadalajara are the crafts and artworks which come from the regions Tonalá, Tlaquepaque and Zapopan. But international industries can be found as well, to mention a few names there are Siemens, Hitachi, Intel and much more. The architectural variety in Guadalajara includes baroque as well as ultra modern with a new Guggenheim museum to be finished in 2010. And Guadalajara has its own pyramid at Ixtepete. From anywhere at the Jalisco coastal area shopping tours to Guadalajara are available. Transport: Taxi, bus, aircraft, helicopter. If You own a Guadalajara related site please suggest the site to be added to the Guadalajara directory. Your travelogues, Articles and Guadalajara photos are welcome, please submit them by email.